Author: Wheeler, Tom Set In . . .
North America, USA, Virginia, Shenandoah Valley, Washington D.C. The Civil War was the first "modern war." Because of the rapid changes in American society, Abraham Lincoln became president of a divided United States during a period of technological and social revolution. Among the many modern marvels that gave the North an advantage was the telegraph, which Lincoln used to stay connected to the forces in the field in almost real time. No leader in history had ever possessed such a powerful tool to gain control over a fractious situation. An eager student of technology, Lincoln (the only president to hold a patent) had to learn to use the power of electronic messages. Without precedent to guide him, Lincoln began by reading the telegraph traffic among his generals. Then he used the telegraph to supplement his preferred form of communication—meetings and letters. He did not replace those face-to-face interactions. Through this experience, Lincoln crafted the best way to guide, reprimand, praise, reward, and encourage his commanders in the field. 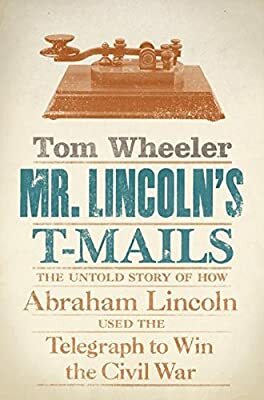 Mr. Lincoln's T-Mails tells a big story within a small compass. By paying close attention to Lincoln's "lightning messages," we see a great leader adapt to a new medium. No reader of this work of history will be able to miss the contemporary parallels. Watching Lincoln carefully word his messages—and follow up on those words with the right actions—offers a striking example for those who spend their days tapping out notes on computers and BlackBerrys. An elegant work of history, Mr. Lincoln's T-Mails is an instructive example of timeless leadership lessons.